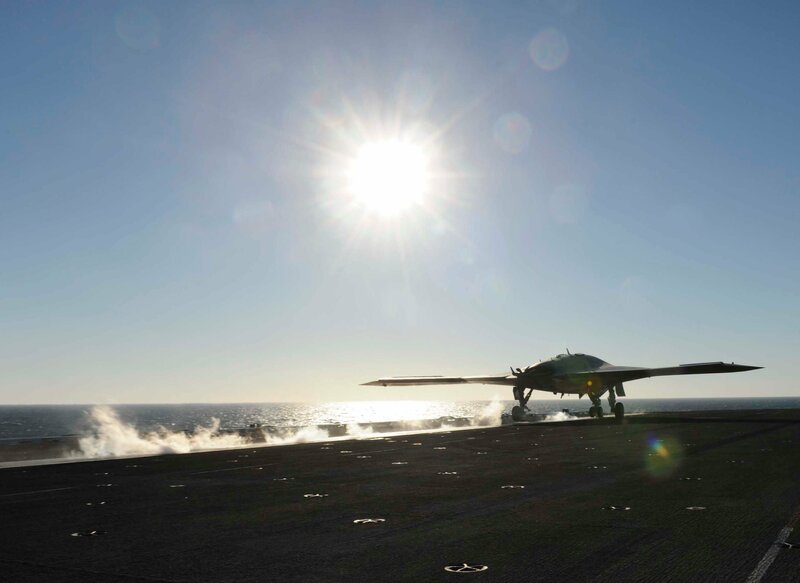 After months of deliberation, the name and designation of the Navy’s first carrier unmanned aerial vehicle are now official: MQ-25A Stingray, service officials told USNI News this week. Approved following a lengthy U.S. Air Force Material Command process for not only for the official “designation” (MQ-25A) but also the “popular name” (Stingray), the service can now have an official title for the unmanned aerial vehicle that’s had several labels since late last year. The word came to the Navy via a July 11 memo from the Air Force. (Technically, as of Friday, the designation is ZMQ-25A until a contract is awarded for the airframe when the Stingray will shed the Z). The final name is an indication of marked changes in the character of the program for the aircraft that the service hopes will launch from catapults and recover with arresting wires in the next several years. In 2006 the program was conceived as a low observable lethal, and deep penetrating strike platform (Unmanned Combat Aerial Vehicle), as outlined in the 2006 Quadrennial Defense Review. In 2011 the tenor of the program changed again with additional influence from the Office of the Secretary of Defense to the less stealthy and lightly armed Unmanned Carrier Launched Airborne Surveillance and Strike (UCLASS) program that could serve as a stopgap for counter-terrorism operations if the U.S. lost their UAV bases in Afghanistan. Internally, NAVAIR referred to the UCLASS program’s airframe as the RAQ-25A (RAQ = reconnaissance and attack unmanned vehicle), several sources confirmed to USNI News. Following intense congressional scrutiny the Navy’s UCLASS program was pulled into an overarching UAV strategic program review (SPR) led by Deputy Secretary of Defense Bob Work. During the SPR, the UCLASS program was recast to serve primarily as an unmanned tanker and given the hastily assembled moniker from big Pentagon — Carrier Based Aerial Refueling System (CBARS). Navy leaders were underwhelmed with the choice. “I’m not sure I’m too much in love with that CBARS name, Chief of Naval Operations Adm. John Richardson said on Feb. 12. The emphasis on the first airframe in the program is primarily aerial refueling, officials said. “We’re probably going to drop some of the high-end specs and try to grow the class and increase the survivability [later],” Vice Adm. Joseph Mulloy, deputy chief of naval operations for integration of capabilities and resources, told USNI News in February. To tack to the more multi-mission orientation the Navy consulted with the Air Force to change the designation to multi-mission unmanned vehicle (MQ). Also in February, Secretary of the Navy Ray Mabus’ office began inserting the term “Stingray” into written testimony before Congress and ceased using the CBARS term to refer to the UAV that was once known as UCLASS. Though Mabus’ office would not confirm, the name is thought to be a reference to the Navy Secretary who once famously said the F-35B Lighting II would be the last would likely be the last manned strike fighter the Navy would ever buy. Moving forward, the Stingray will only be a third of the components the Navy will use for the first carrier based UAV. While the requirements for the airframe have changed, the service is leveraging the ground control station and the connectivity piece from the original UCLASS effort. The draft request for proposal for the Stingray air segment is slated to be issued to the four likely competitors – Boeing, Northrop Grumman, Lockheed Martin and General Atomics by the end of the year. The final RfP for the air segment is set for 2017. The service hopes to have the first Stingrays operational in the 2020s.